Letter No. 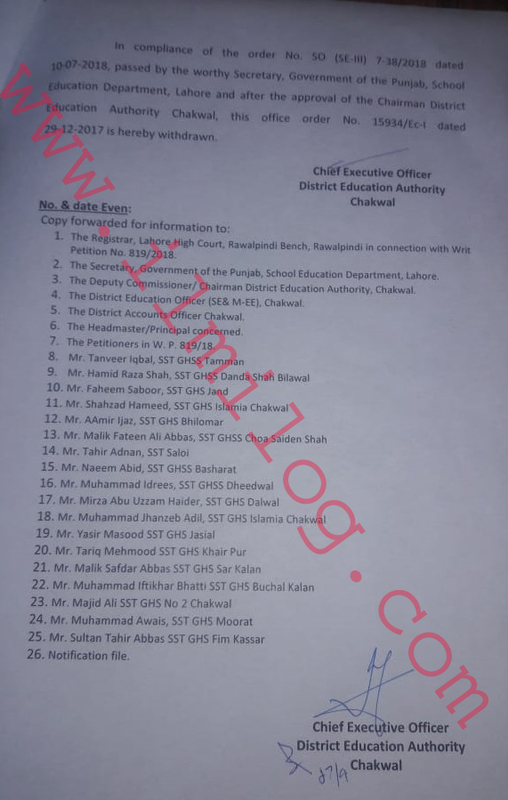 3895/EC-I dated 28-09-2018 is issued by the office of the chief executive officer District Education Authority Chakwal regarding Secretary Education & High Court Judgement of Punjab Educators. Through upward Mobility Package, eighteen Secondary School Teachers (SST) were awarded BS- 17 through upward mobility package, by this office vide order No. 15934/Ec-1 dated 29-12-2017. The 2. above-mentioned order was challenged by thirty-three Secondary School Teachers (SST) through Writ Petition No. 819/2018 tilted as Muhammad Arif Siddique etc. Vs Government of the Punjab etc. before the Lahore High Court, Rawalpindi Bench, and Rawalpindi. 3. Petitioners claimed that they were senior to the respondents No. 5-22 in Writ Petition No. 819/2018, because they were promoted as SST on 06-01-2011 whereas the respondents No. 5 to 22 acquired the professional qualification (B.Ed.) after the promotion of the Petitioners so services of the respondents No. 5-22 were to be regularized w.e.f. the date of declaration of their B.Ed. the result, instead of 19-10-2009. They prayed to allow the instant Writ Petition and promotion orders issued by the respondent No. 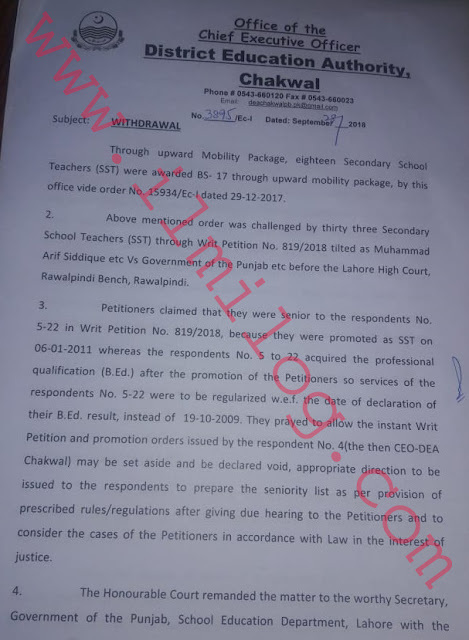 4(the then CEO-DEA Chakwal) may be set aside and be declared void, appropriate direction to be issued to the respondents to prepare the seniority list as per provision of prescribed rules/regulations after giving due hearing to the Petitioners and to consider the cases of the Petitioners in accordance with Law in the interest of justice. 4. 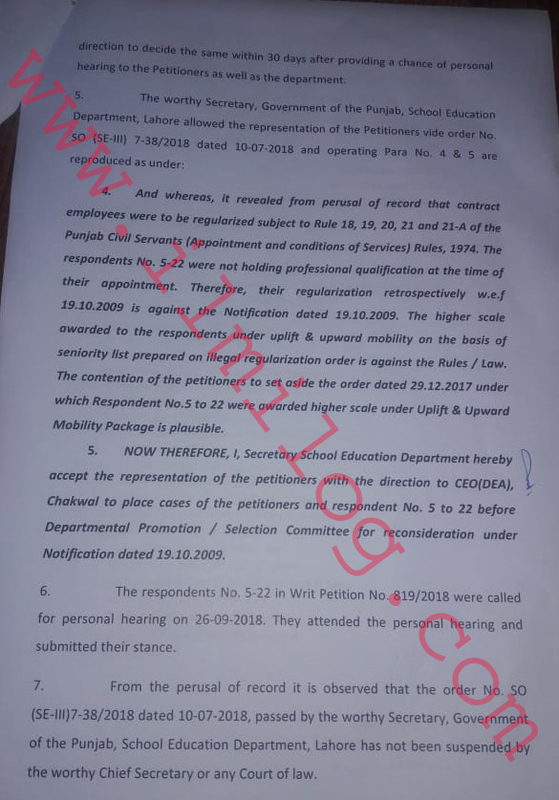 And whereas, It revealed from a perusal of record that contract employees were to be regularized subject to Rule 18, 19, 20, 21 and 21-A of the Punjab Civil Servants (Appointment and conditions of Services) Rules, 1974. The respondents No. 5-22 were not holding a professional qualification at the time of their appointment. Therefore, their regularization retrospectively w.e.f 19.10.2009 is against the Notification dated 19.10.2009. The higher scale awarded to the respondents under uplift & upward mobility on the basis of seniority list prepared on illegal regularization order is against the Rules / Law. The contention of the petitioners to set aside the order dated 29.12.2017 under which Respondent No.5 to 22 were awarded higher scale under Uplift & Upward Mobility Package is plausible. 5. NOW, THEREFORE, I, Secretary School Education Department hereby accept the representation of the petitioners with the direction to CEO (DEA), Chakwal to place cases of the petitioners and respondent No. 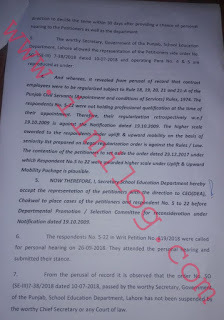 5 to 22 before Departmental Promotion / Selection Committee for reconsideration under Notification dated 19.10.2009. 6. The respondents No. 5-22 in Writ Petition No. 819/2018 were called for a personal hearing on 26-09-2018. They attended the personal hearing and submitted their stance. 7. From the perusal of the record, it is observed that the order No. SO (SE-I11)7-38/2018 dated 10-07-2018, passed by the worthy Secretary, Government of the Punjab, School Education Department, Lahore has not been suspended by the worthy Chief Secretary or any Court of law. cc: 1. The Registrar. Lahore High Court. Rawalpindi Bench. Rawalpindi in connection with Writ Petition No. 819/2018. 2. The Secretary, Government of the Punjab, School Education Department, Lahore. 3. 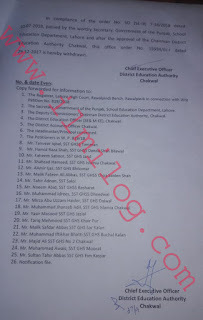 The Deputy Commissioner/ Chairman District Education Authority. Chakwal 4. The District Education Officer (SE& MEE). Chakwal. 5. The 0151110 Accounts Officer Chakwal. 6. The Headmaster/Principal concerned. 7. The Petitioners in W P. 819/18. 8. Mr. Tanveer Igbal, SST GHSS Tamman 9. Mr. Hamid Raza Shah. SST GHSS Danda Shah Bilawal 10. Mr. Faheem Saboor, SST GHS land 11. Mr. Shahzad Hameed, SST GHS Islamia Chakwal 12. Mr. AAmir liar, SST GHS Bhrlomar 13. Mr. Malik Fateen Ali Abbas, SST GHSS Choa Saiden Shah 14. Mr. Tahir Adnan. SST Saloi 15. Mr. Naeem Abid, SST GHSS Basharat 16. Mr. Muhammad Idrees, SST GHSS Dheedwal 17. Mr. Mirza Abu Uzzam Haider. 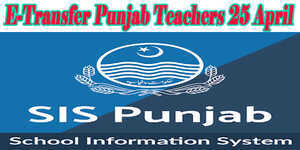 SST GHS Dalwal 18. Mr. Muhammad Jhanzeb Add, SST GHS Islamia Chakwal 19. Mr. Yasir Masood SST GHS labial 20. Mr. Tanq Mehmood SST GHS Khair Pur 21. Mr. Malik Safdar Abbas SST GHS Sar Kalan 22. Mr. Muhammad Iftikhar Bhatti SST GHS Buchal Kalan 23. Mr. Majid All SST GHS No 2 Chakwal 24. Mr. Muhammad Awais, SST GHS Moorat 25. Mr. Sultan Tahir Abbas SST GHS Fim Kassar 26. Notification file.